The odds of a hole-in-one have been calculated at 12,500 to one for the average amateur. An ace on a par-4? That’s anywhere between a million and a six million to one long shot, depending on whose statistics you trust. What about two albatross aces on the same hole within a week? Forget it, right? Wrong. 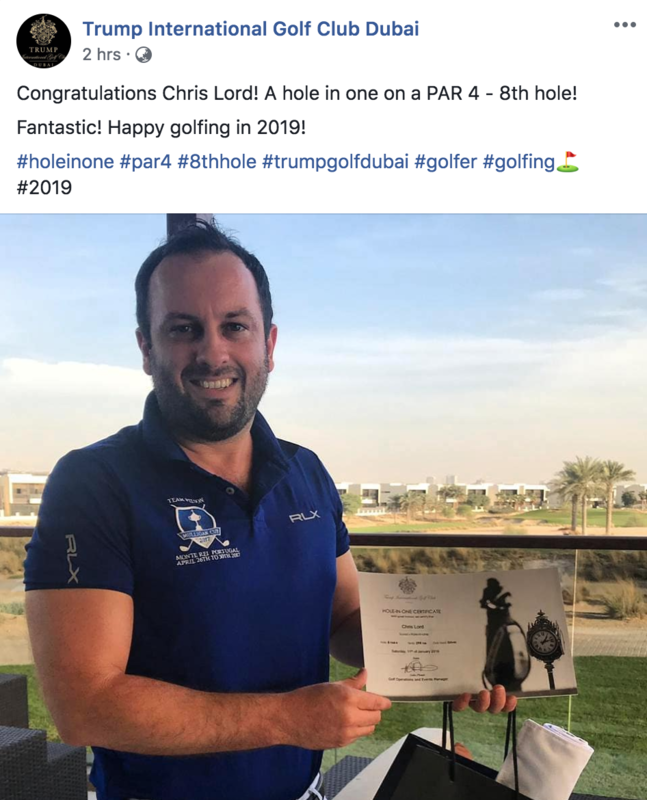 Just three days after former Ryder Cupper Nicolas Colsaerts aced the par-4 8th hole at Trump International Golf Club Dubai, amateur Chris Lord has repeated the freaky feat on the very same hole. Lord, a green fee paying visitor to the Gil Hanse-design, produced his perfect shot with a driver from the 300 yard blue tees. Colsaerts also pulled driver from the championship tees 30 yards further back for the first ace of his career on Thursday. It’s hard to believe, especially if you’re one of those amateurs like us still wildly swinging away in the hope of golf’s perfect shot. So, what are your odds of making a hole in one on a teeny-weeny par-3? 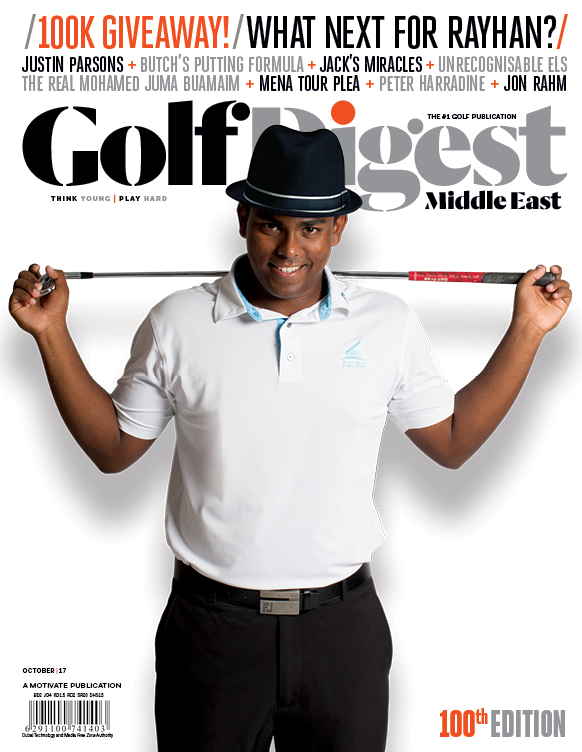 With the hindsight of 60 years of data and a little help from the America’s National Hole in One Association, Golf Digest put your odds at 12,500 to one in a story from 2013. 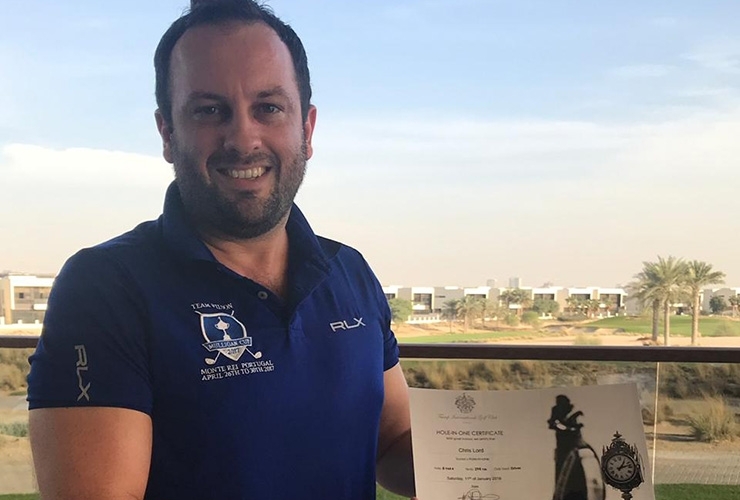 The figure dips to 5000 to one for a low handicapper although you’ll probably get even shorter odds if you draw a driver on the 8th at Trump Dubai, arguably now the easiest tricky little par-4 in the UAE. For further context, a 2018 story published by the PGA of America, quoting The Double Eagle Club (which touts itself as “the worldwide registry for double eagles scored”) put the odds of an albatross at an estimated six million to 1. The report went on to quote Dean Knuth, who was senior director of the handicap department at the USGA from 1981 to 1997, saying the odds were closer to a million-to-one shot, which makes you more likely to be struck by lightning. Either way, a hole in one on a par three is tough enough and makes the tale of Lord and Colsaerts all the more extraordinary. Anyone for round at Trump? You’ll find us on the 8th tee.